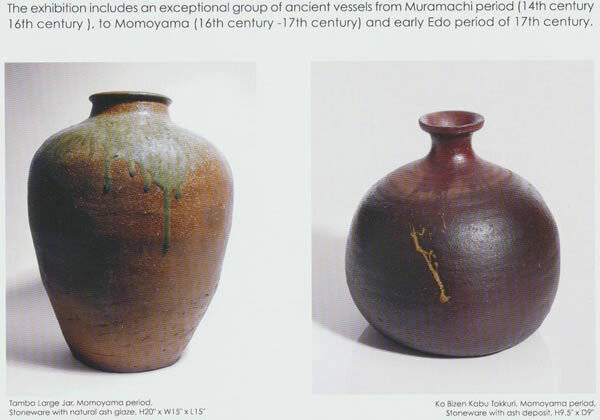 Sake Vessels by Japanese and Western Artists. 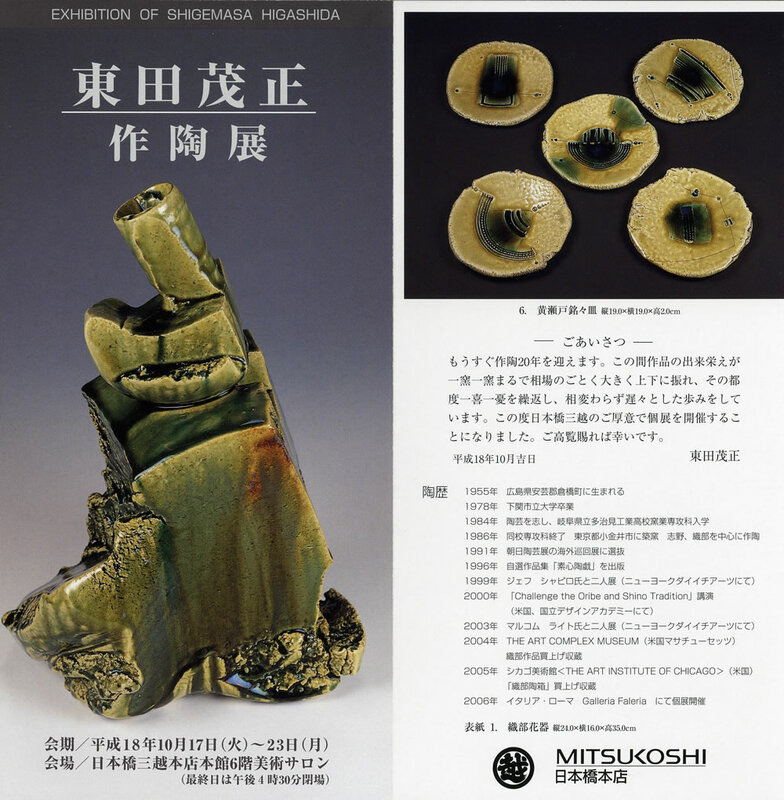 09/04 - 09/13　"Shigemasa Higashida Ceramic Exhibition "
Exhibition mainly SHINO and ORIBE about 100 works. 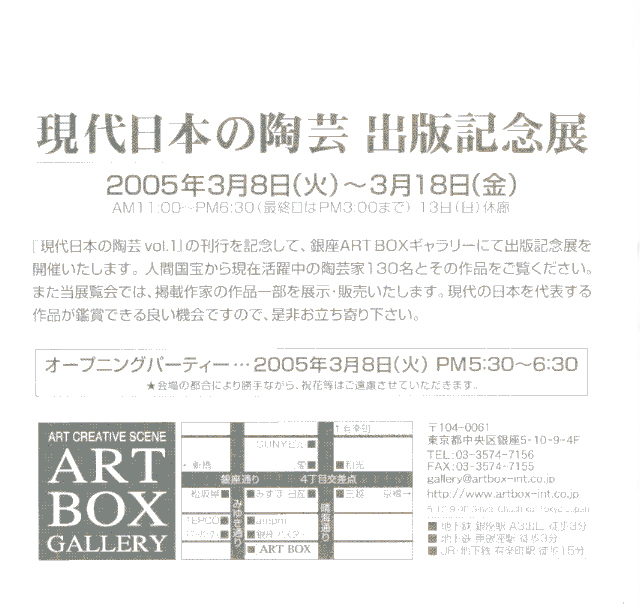 During a session, work explanation is performed at the hall. 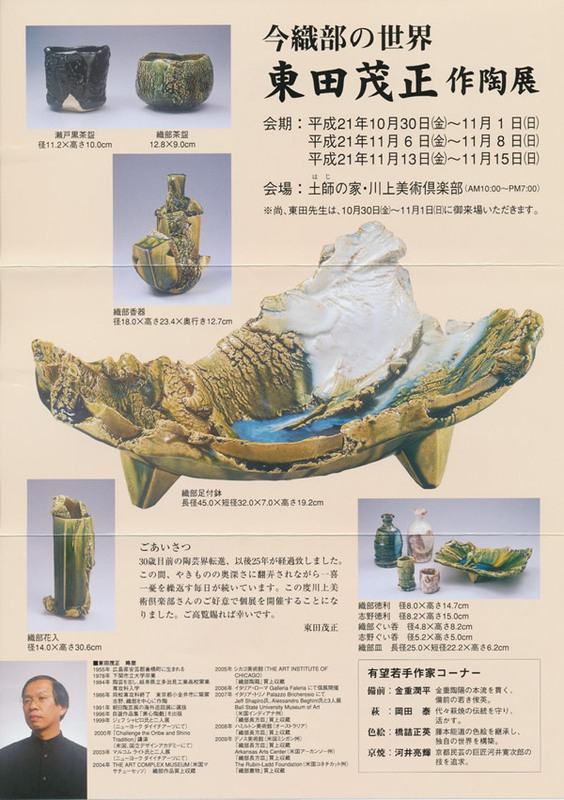 03/18 - 03/21　"The GRANDEUR of Japanese Ceramics: From Tea Ware to Sculpture"
contemporary Japanese ceramics with 10 Living National Treasure including Toyozo Arakawa. 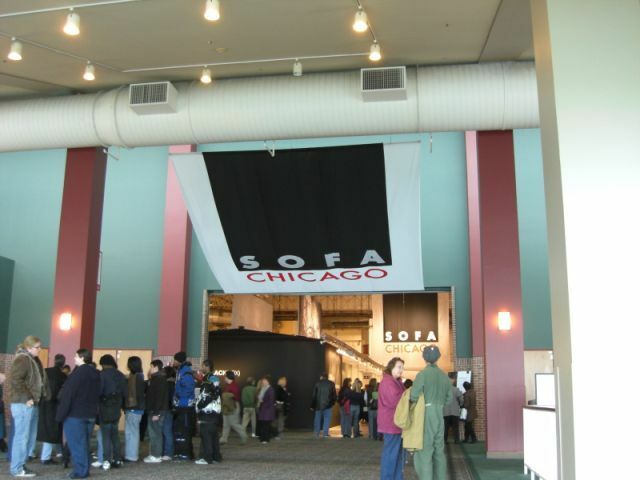 10/31 - 11/13　"SOFA CHICAGO 2013 Exhibition"
11/10 - 12/02　"Jeff Shapirp ＆Shigemasa Higashida Two-person Exhibition"
in every country in the world by living in New York. 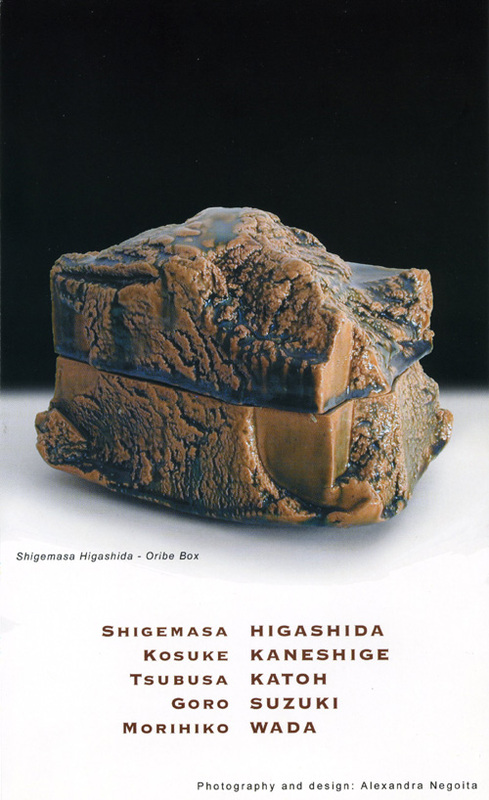 09/03 -09/10　"Shigemasa Higashida Exhition"
Exhibition mainly SHINO and ORIBE about 80 works. 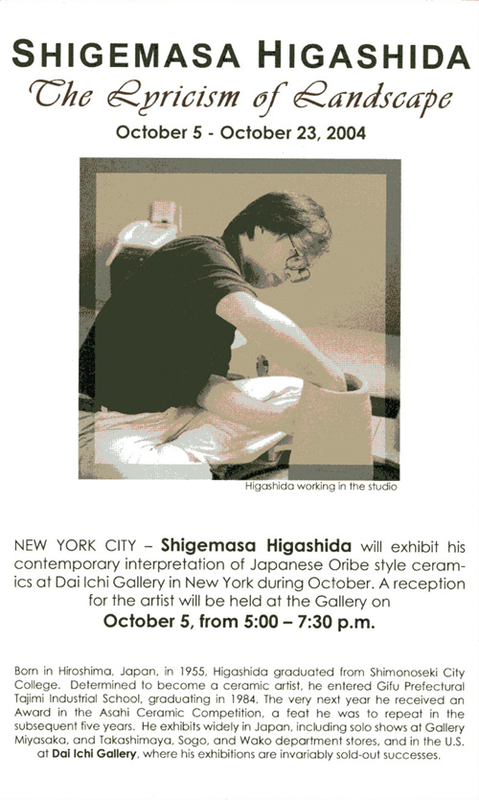 Playing image of ORIBE plate production process in the hall. 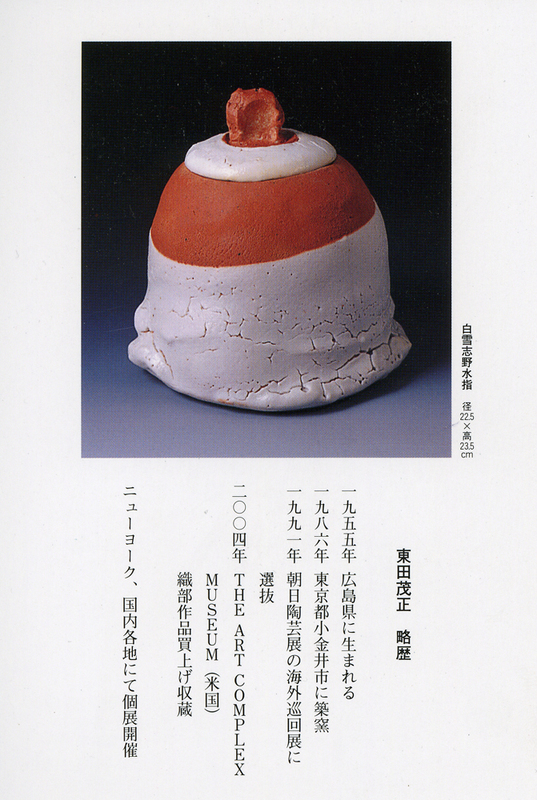 07/01 -07/03　"International Ceramic Festival"
each one demonstrates a good technique, the lecture, and the work exhibition, are held. 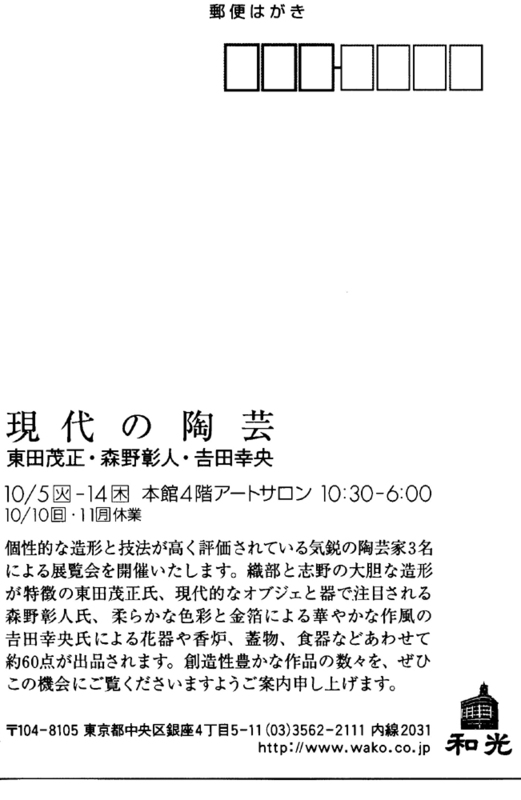 I will exhibit SHINO and ORIBE, demonstrate scraping technique, and lecture on "SHINO and ORIBE". 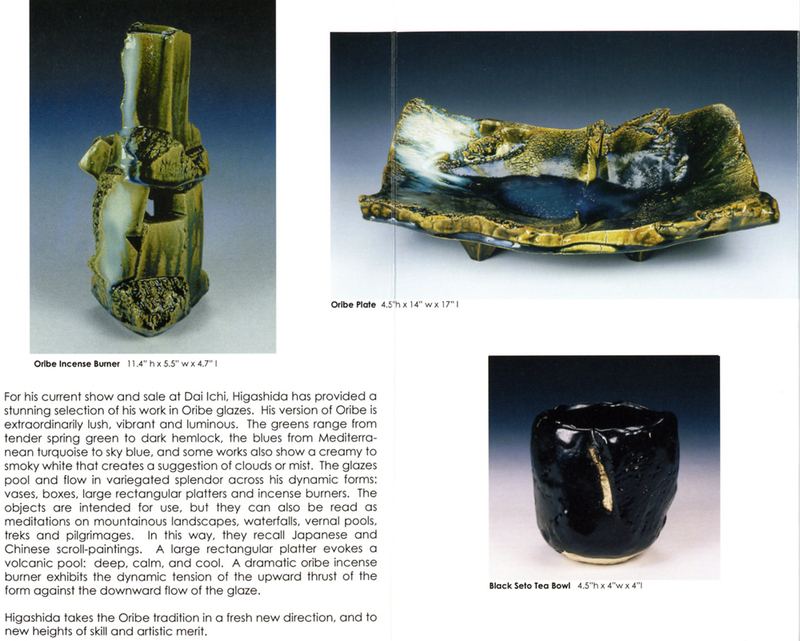 06/26 -09/06　"Cross Currents in 20th Century Art: Prints and Ceramics from the Anne C.　and Harry Wollman Collection"
04/10 -04/18　"HANAMANDARA2010" Exhibit 20 pieces of Oribe and Shino. 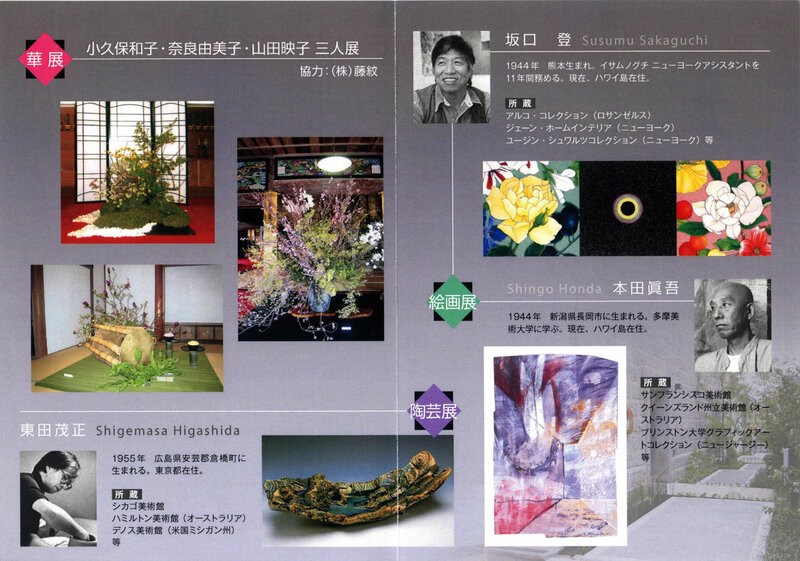 Customary cultural event of flower arrangement, Painting, and ceramic art of Choukou-ji sponsoring. 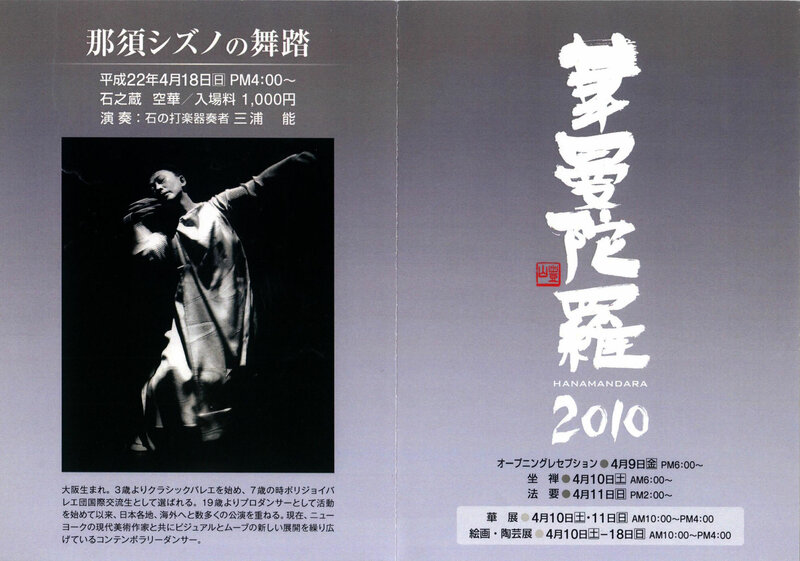 Also, the lecture on the dance by Shizuno Nasu who is active in foreign countries. 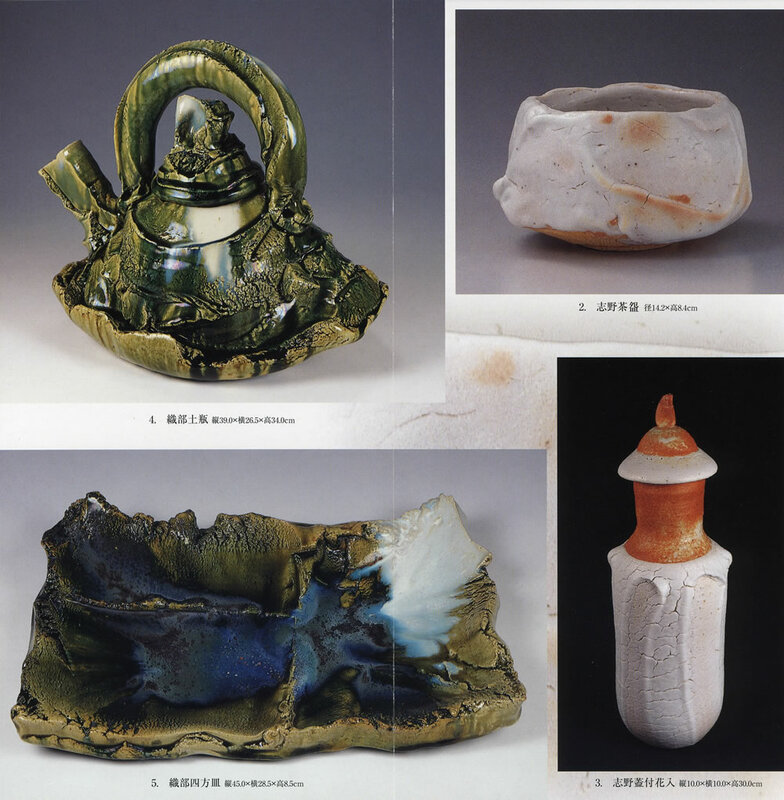 `09/10/03 -01/30　"Breaking the Mold: Contemporary Chinese and Japanese Ceramic Sculpture"
Please look at http://www.svsu.edu/mfsm for details. 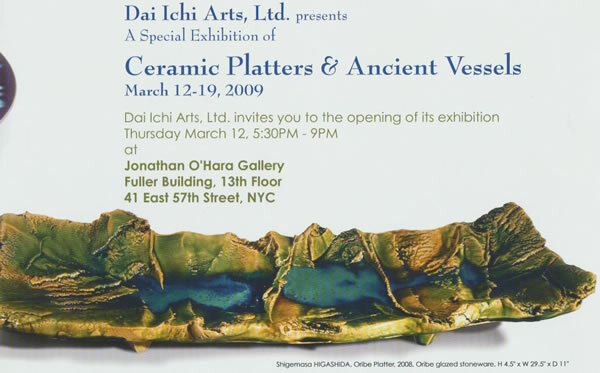 Please look at www.daiichiarts.com for details. 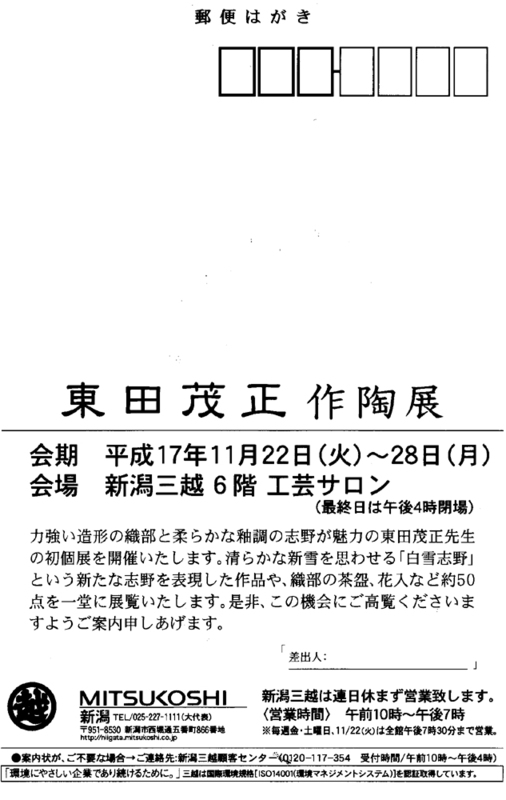 I will explain anout my works at the following schedule. 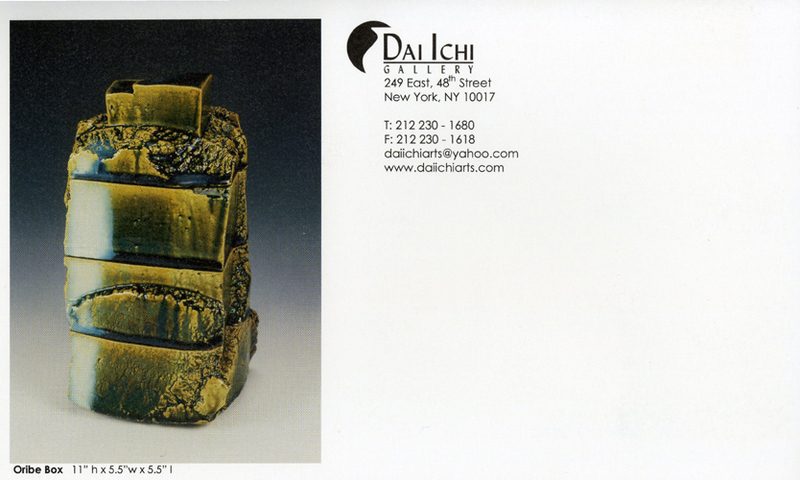 I exhibit 50 pieces such as Shino and Oribe's Tea Bowl, Vase, Plate, and Box. 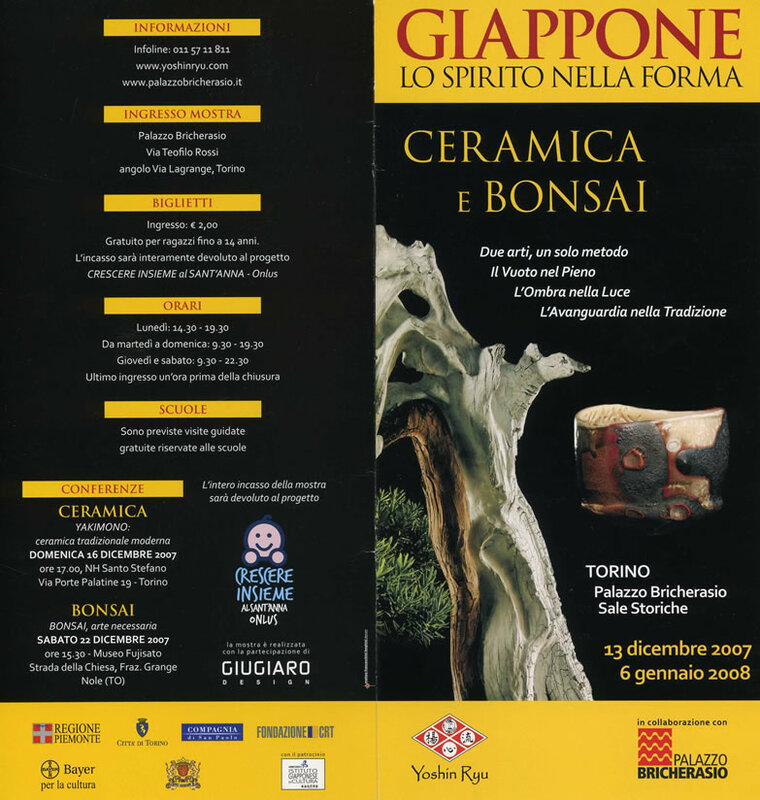 which built before about 400 years in Torino Italy. 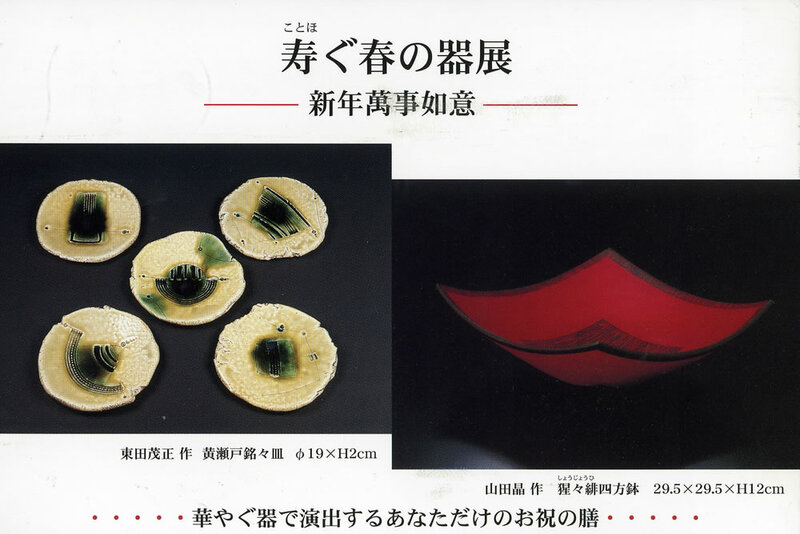 08/31 - 09/02　"Choice Exhibit" （Shapporo Mitsukoshi, Hokkaido) . 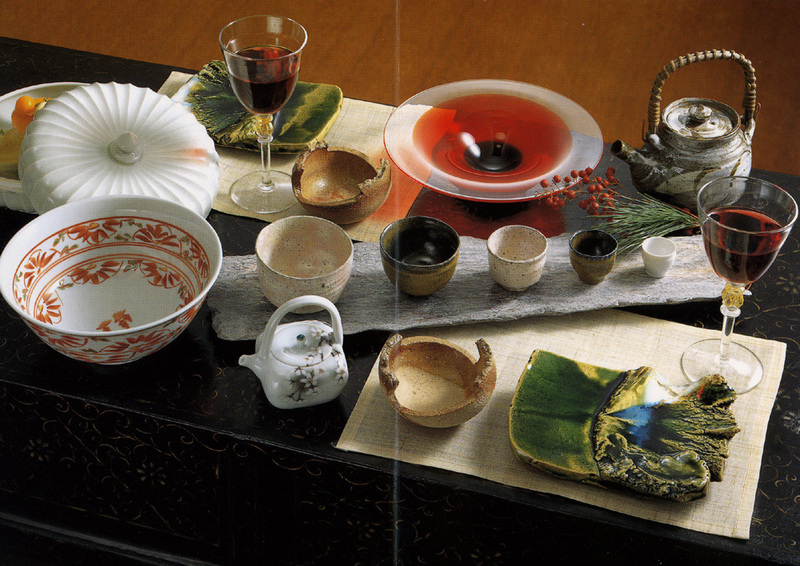 vase, sake bottle, and plate. 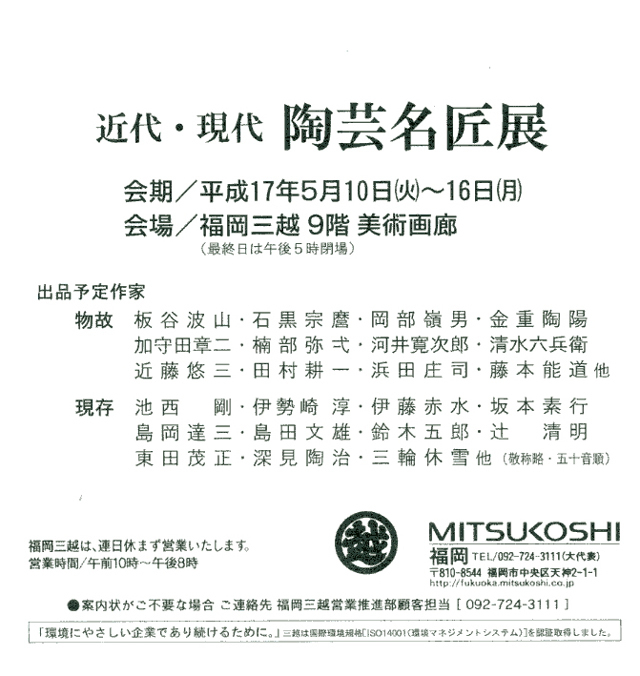 10/19 - 10/22　TAJIMI Techinical Highschoo "The 110th anniversary in establishment" "Alumnus work exhibition") . 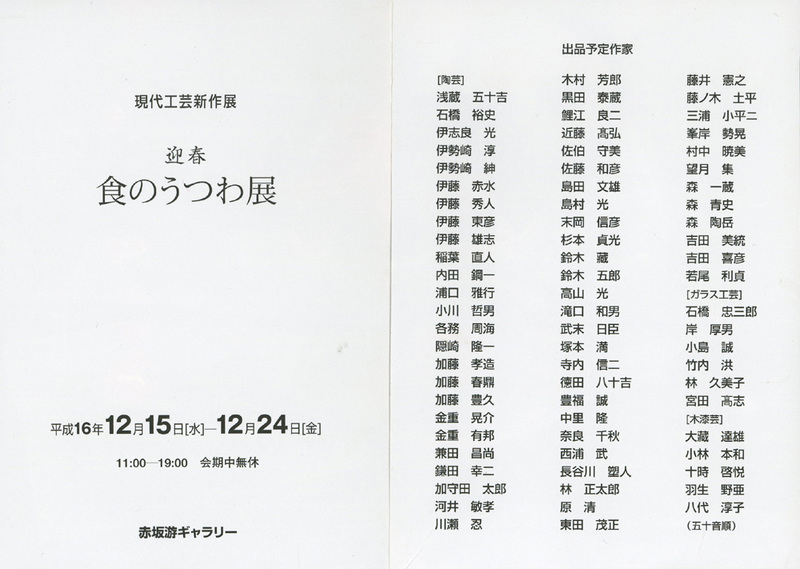 It is a work exhibition by 150 more graduates. 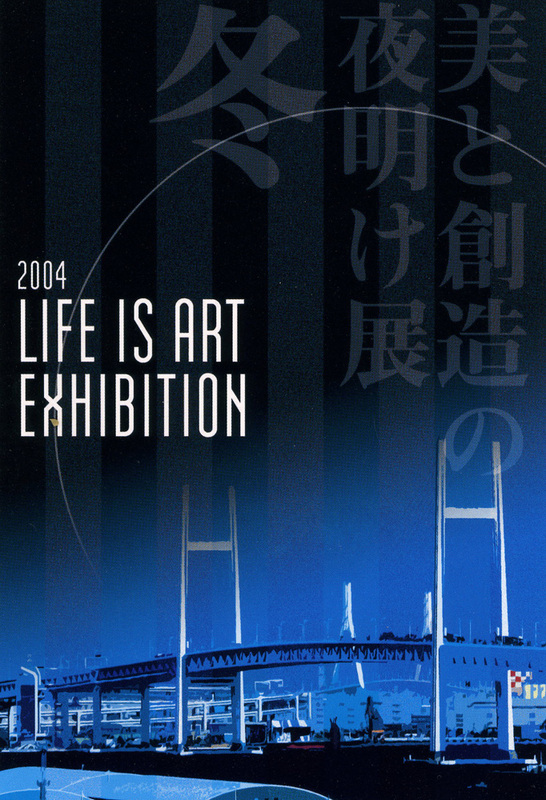 It is a international exhibition from all over the world. 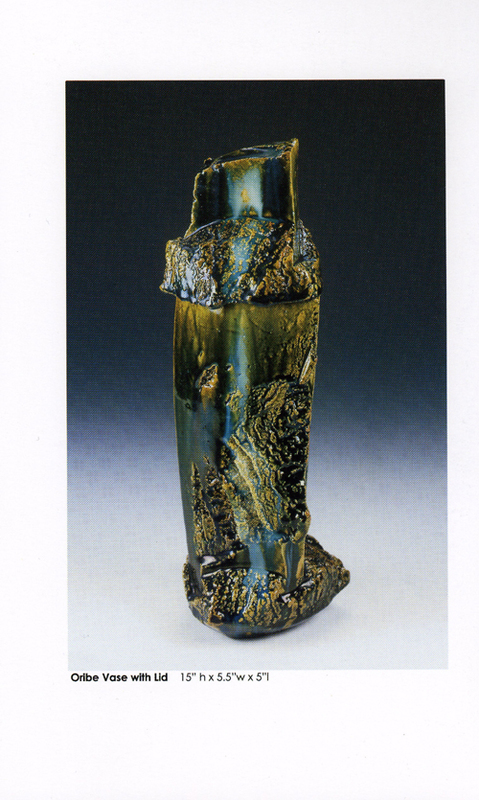 09/10 - 2006,05　"International Ceramic Art Exhibit" Belgium. 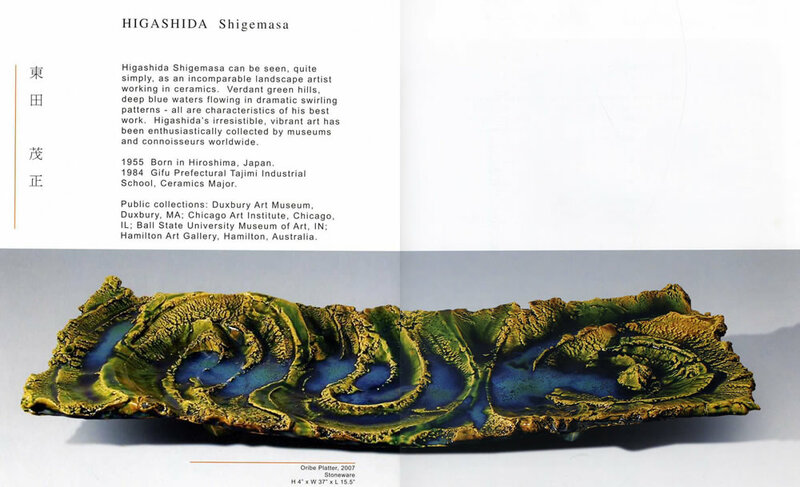 The ceramic artist in 20 countries in the world. 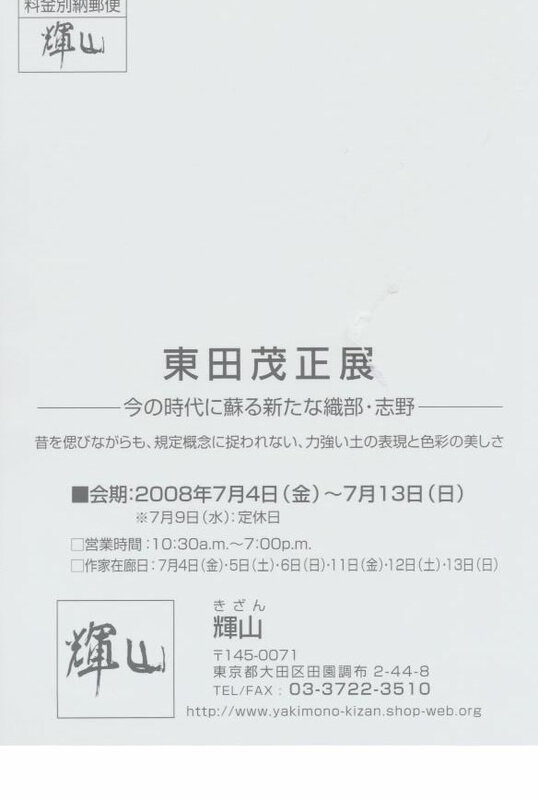 and the session at the end of June. 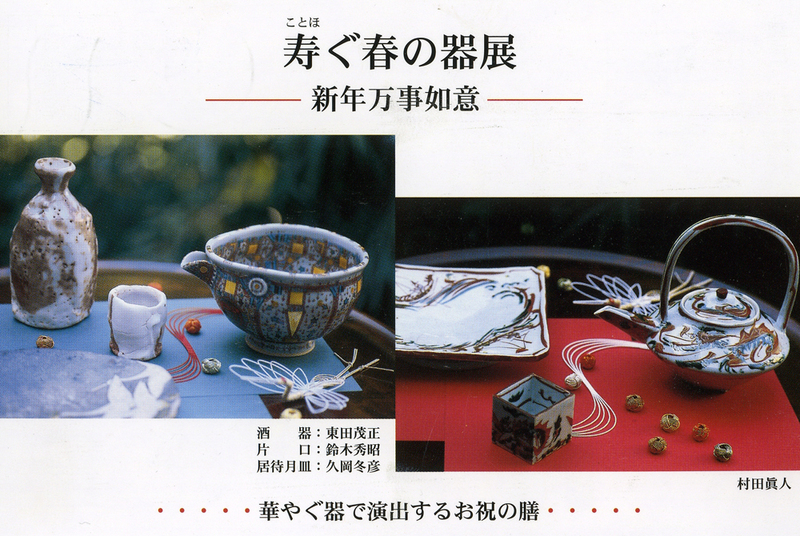 It is a Tea Bowl exhibition by over 10 artists. 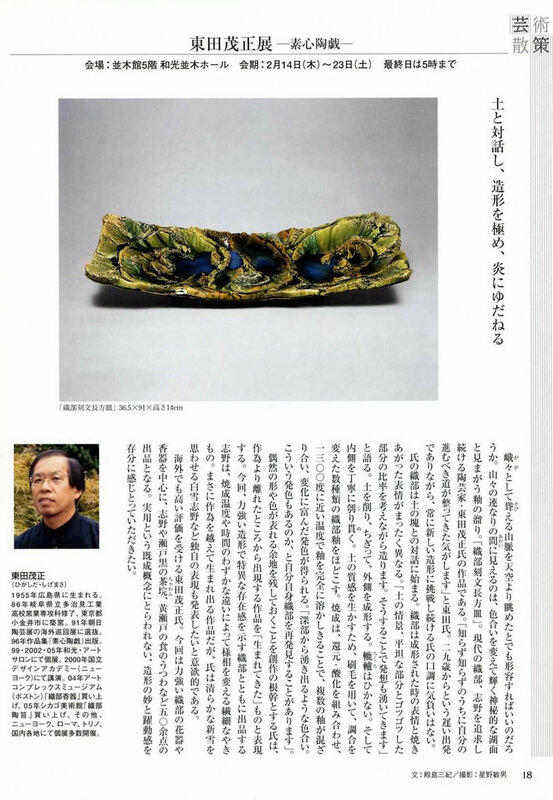 I exhibit "Shino and Kuro Oribe Tea Bowl". 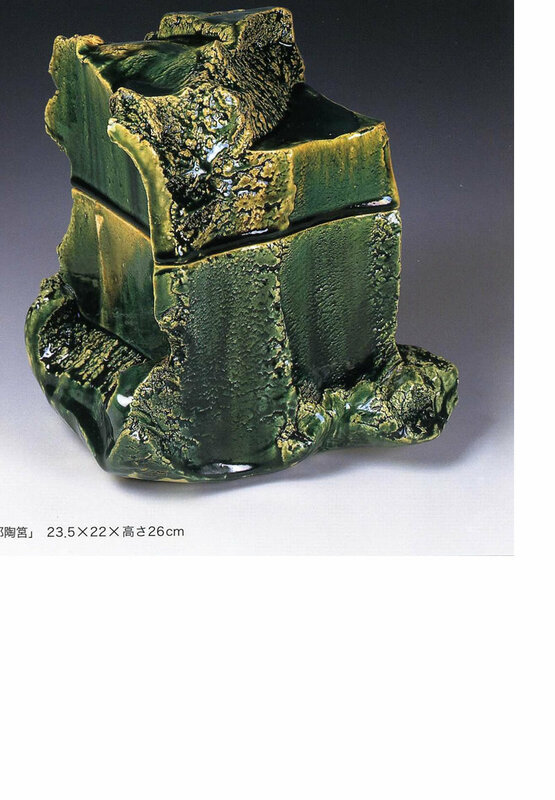 Hokuto Itou "Overglazed Enamel", Shigemasa Higashida "Shino and Oribe". 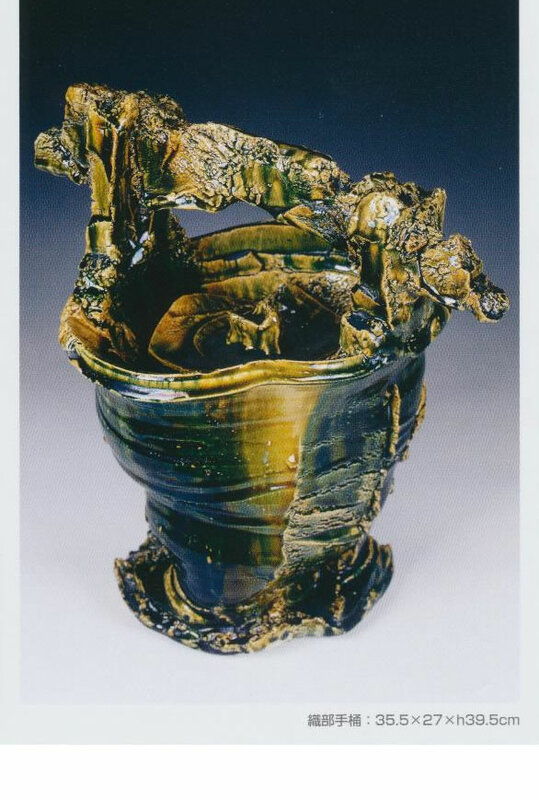 about 20 works such as the jar, Tea　Bowl, Vase, Plateｓ, and ect are exhibited. 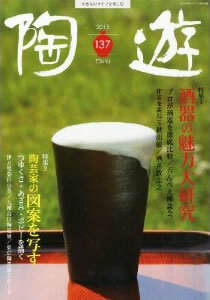 and Sake Bottleor around "Shino ・ Oribe". 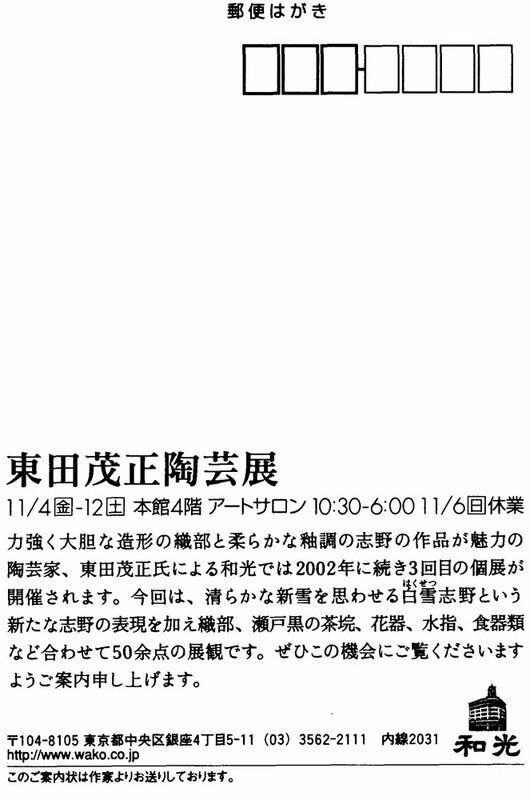 Opening reception "11/4 ： 2pm - 5pm"
It is new works exhibition by more than 10 KIZAN dealings artists. 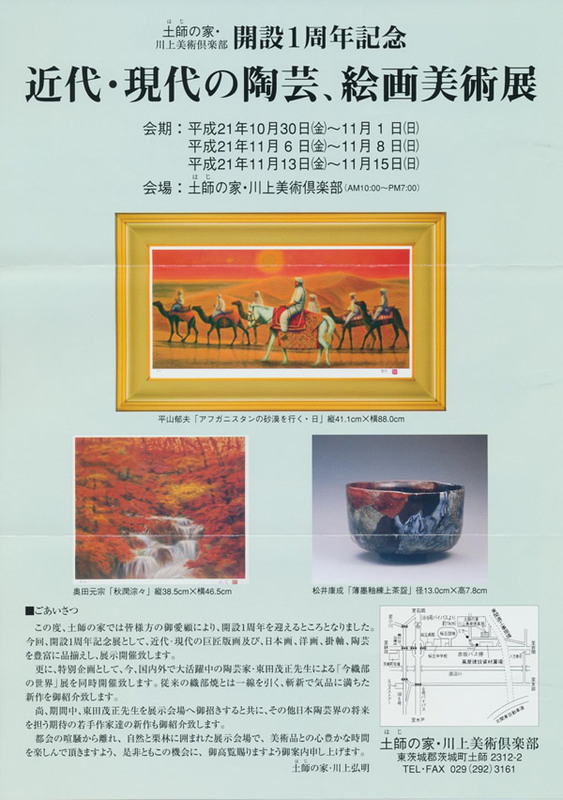 Masanao Kaneta(Hagi), New Utsuwa Exhibit from nationwide various places by 10 artists. 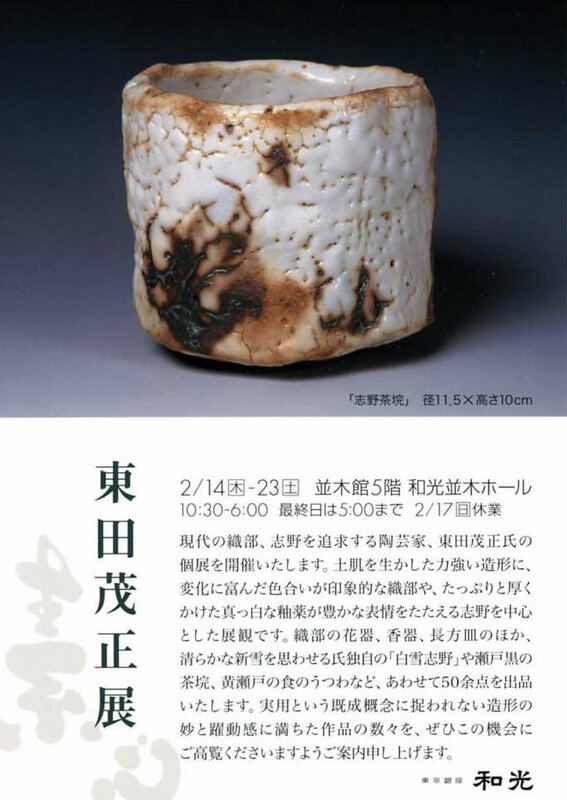 03/08 - 03/18　"Modern Japanese Ceramic Art." 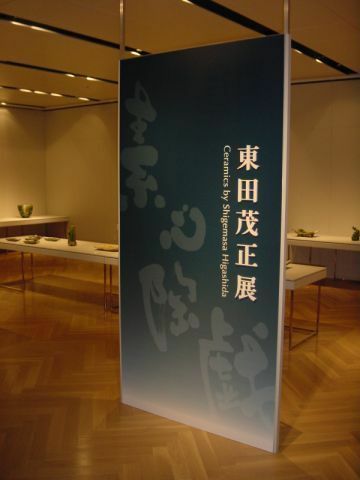 Publication Commemoration Exhibit. 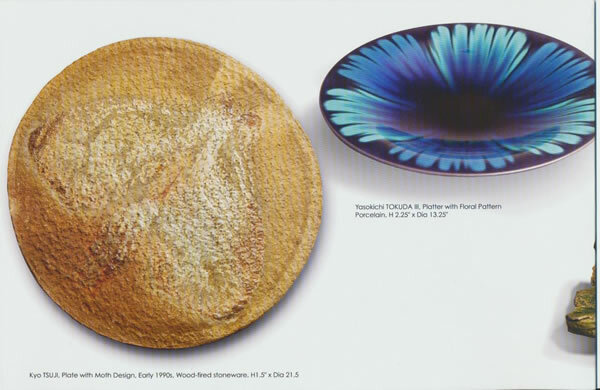 "Rank Improvement Ceramic Art Lesson, Experience! 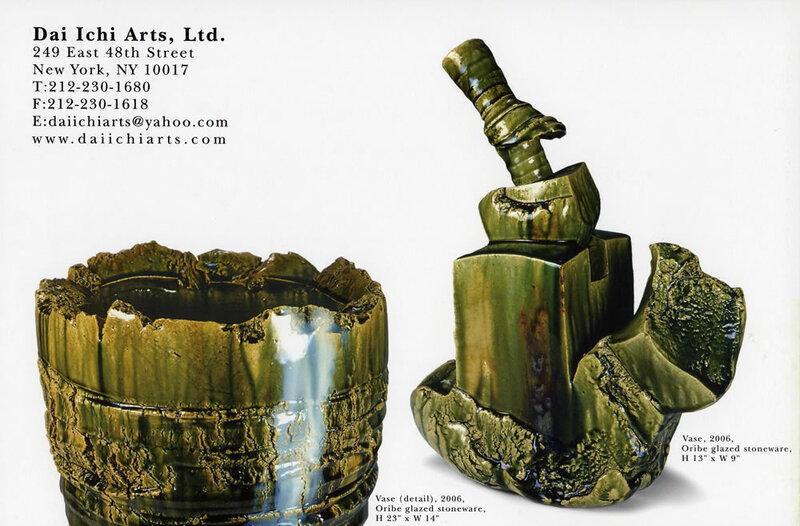 Professional Technique"
Oribe's making technique, the mixture as glaze, firing, and etc. 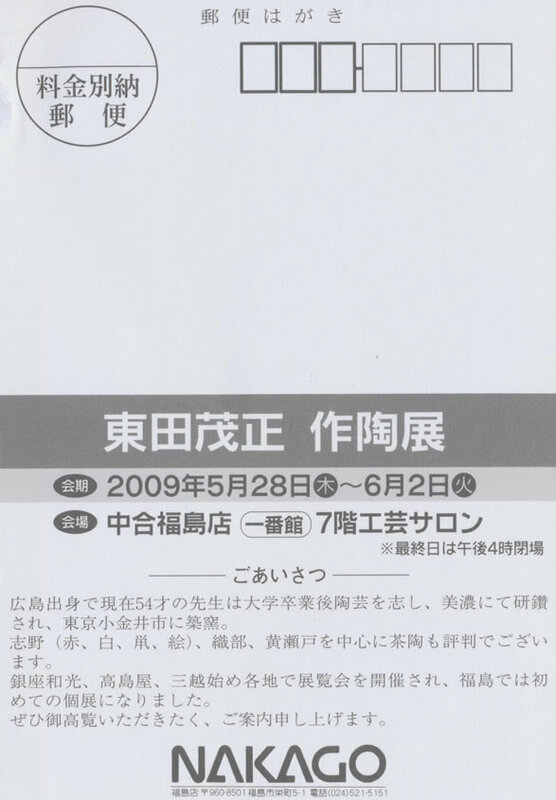 Introduction of opening to the public over 14 pages. 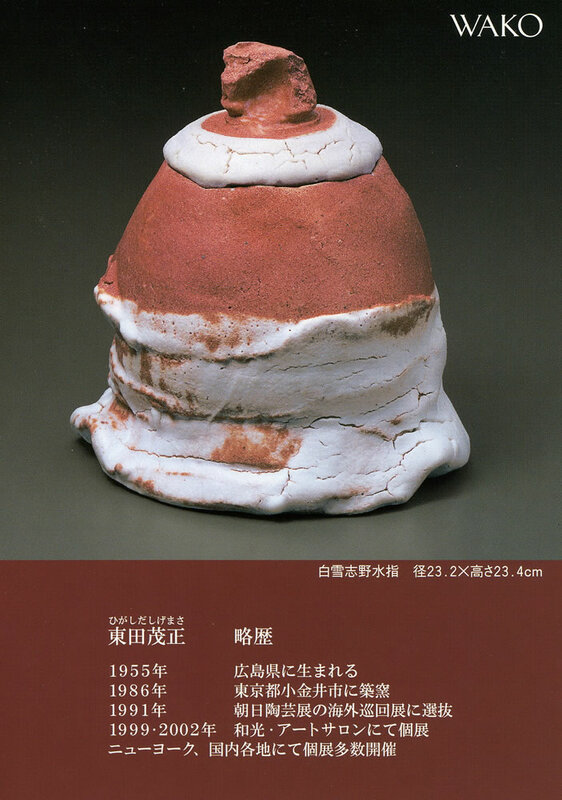 05/05 - 05/16　Modern・Present Ceramic Art Master Exhibit. 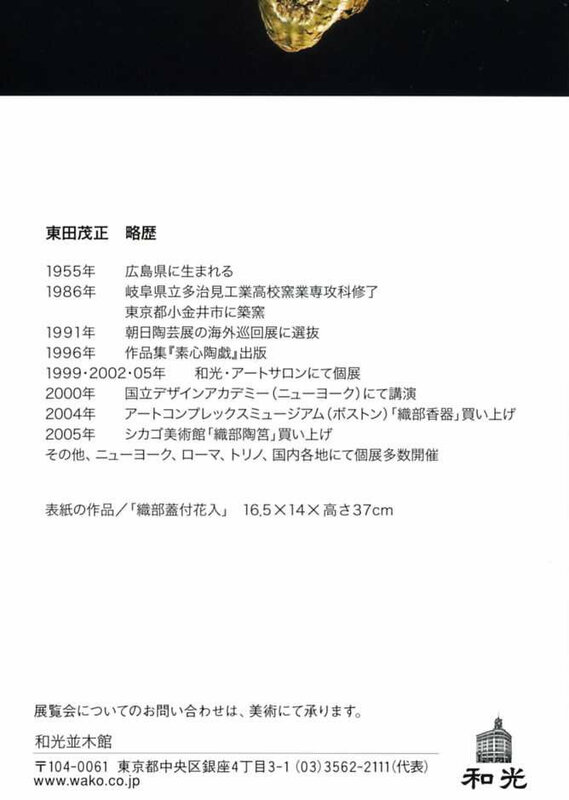 who leaves the history the name now. 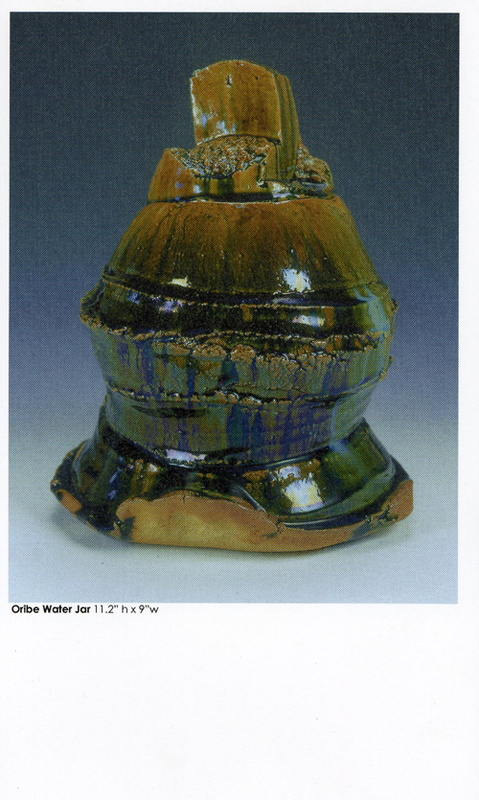 I also am exhibiting several tea bowls. 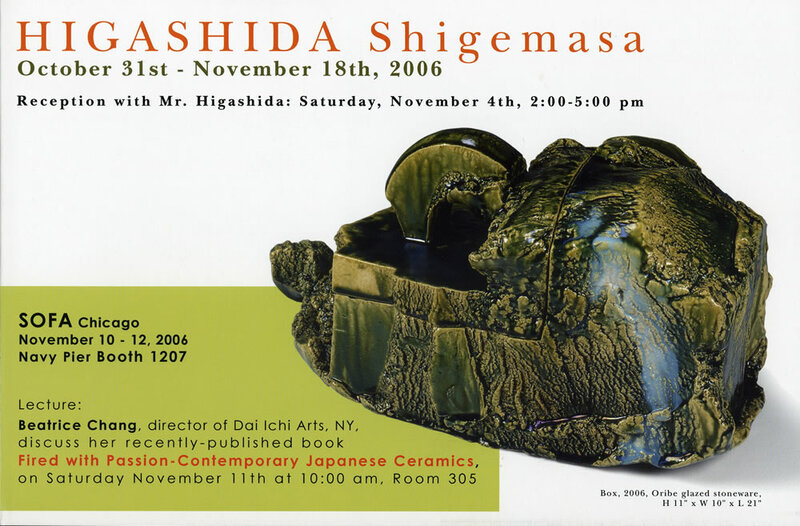 11/04 - 11/12　"Shigemasa Higashida Exhition"
11/22 - 11/27　"Shigemasa Higashida Exhition"
Shino, Oribe, Kuro Oribe tea bowl, box, insence burner, plate, sake bottle, and more. 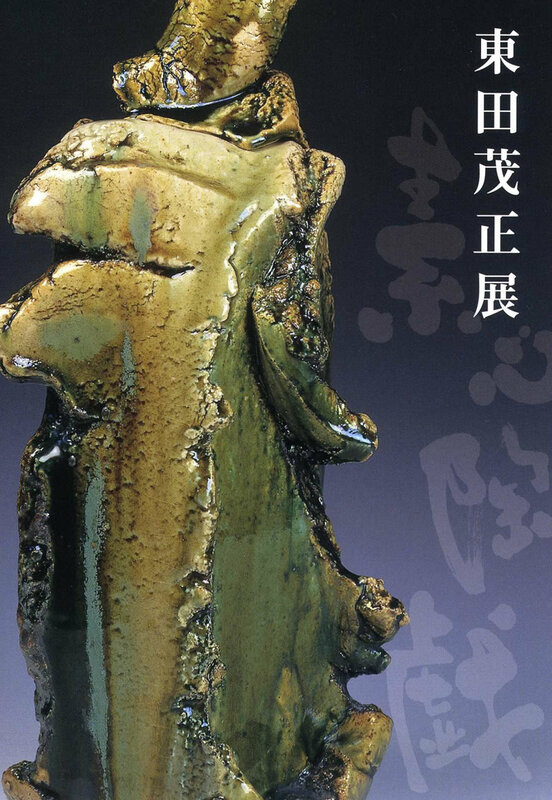 It is new works exhibition of ceramic art and woodwork by 10 KIZAN dealings artists. 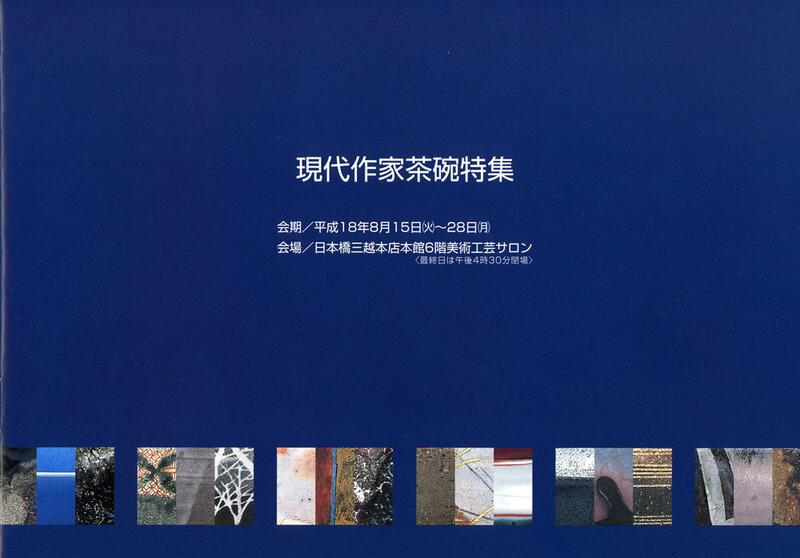 02/25 - 03/31　Working a souvenir with completion of new factory in China. 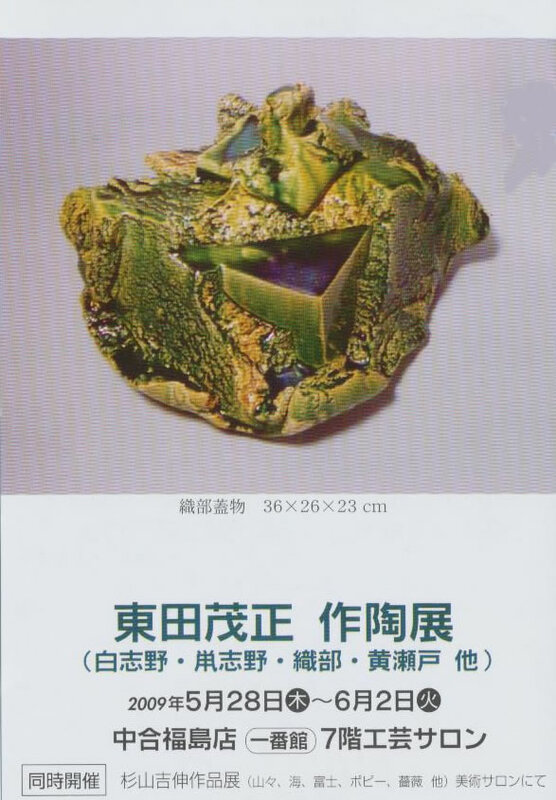 10/05 - 10/14　"Comtemporary Ceramic Art" Three-person Exhibition. 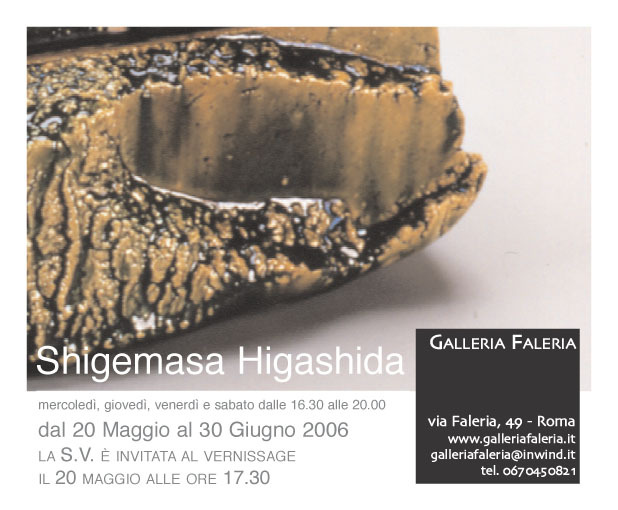 The exhibition by three-person, Yukio Yoshida, Akito Morino, and Shigemasa Higashida. 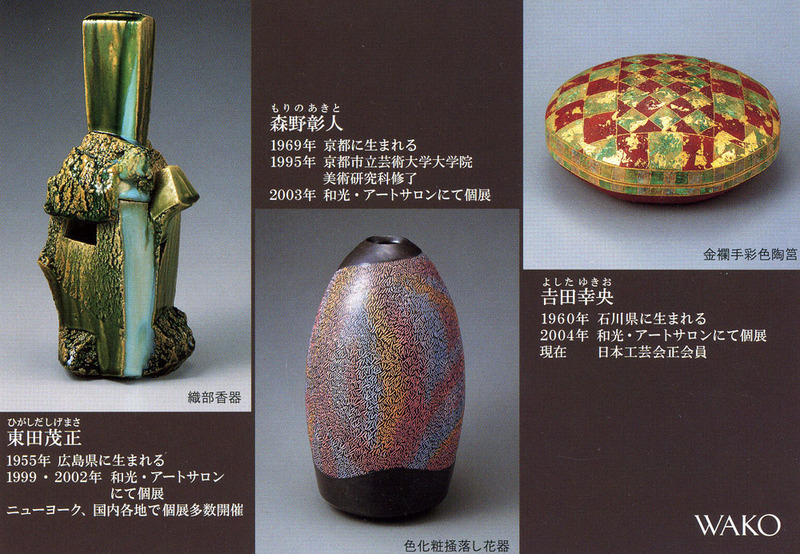 such as vase, box with cover, incense burner, and tableware in all about 60 works. 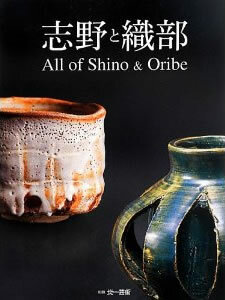 It is 35 works of Oribe and Shino. 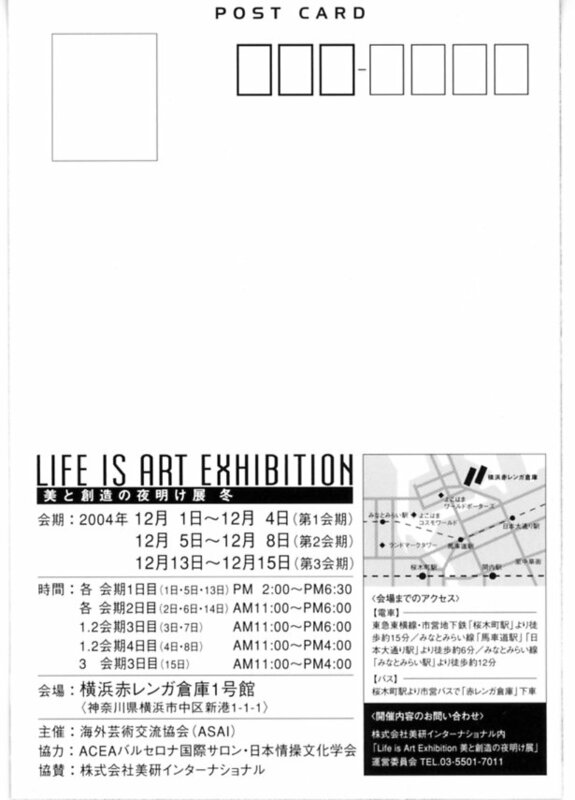 12/05 - 12/08　"2004 LIFE IS ART EXHIBITION"
12/15 - 12/24　"SHOKU NO UTSUWA" Exhibit. 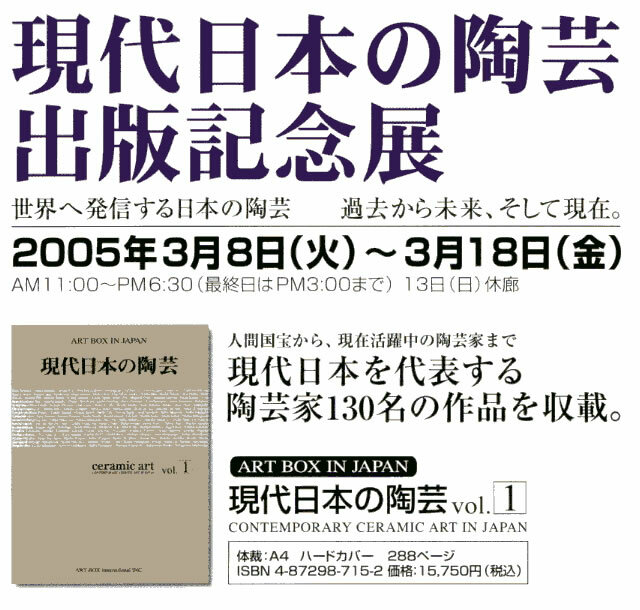 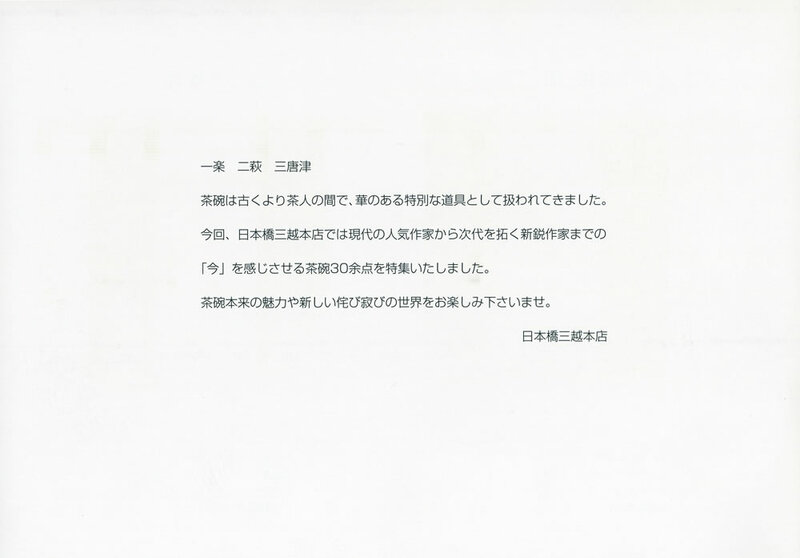 ※Mar - Nov, 2003 Suspending produce and domestic exhibition for rebuilding a studio. 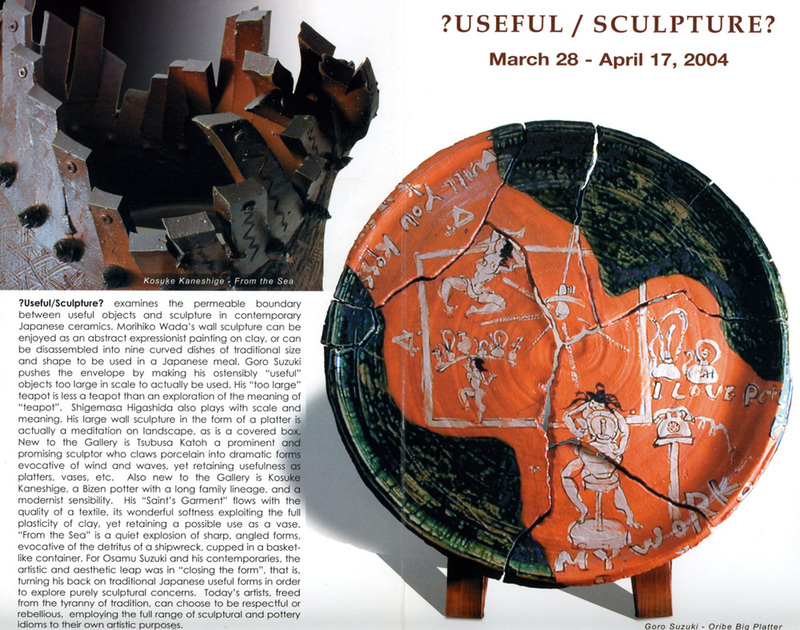 04/07　"Potters East and West" Lecture with Malcom Wright and Jeff Shapiro.